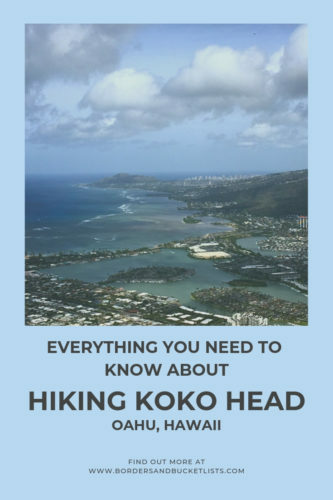 While the term “Koko Head” technically refers to a portion of the town of Hawaii Kai, most people just use the term to refer to Koko Crater and the hike up it. A long time ago, Koko Head Crater was actually a volcano, so the remnants of the volcano are this cool crater! Many, many years later, a railroad track was built to the top of the crater for military purposes during World War II. 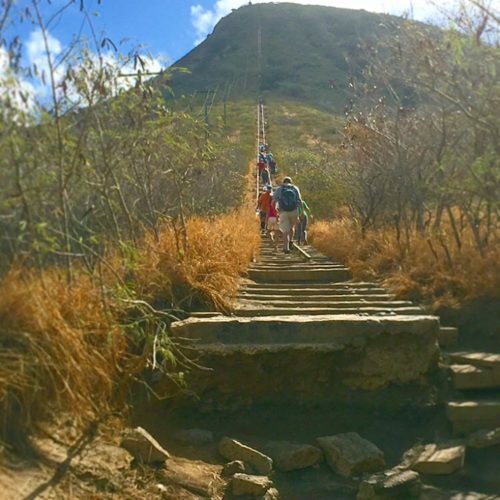 The railroad is currently not in use, but the 1,000 “steps” of the railroad track now constitute one of the most popular and difficult hikes on Oahu. Koko Head is located on the southeast tip of Oahu in an area known as Hawaii Kai. The directions to Koko Head are actually quite easy, as if you simply put “Koko Head Trailhead Parking Lot” into Google Maps, it’ll get you to the parking lot. From there, you can just follow the people to the far end of the parking lot and on a small trail until you see the daunting 1,000 steps. 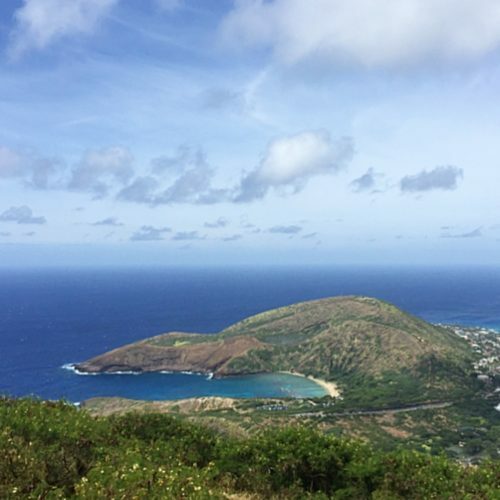 When Is the Best Time to Hike Koko Head? There is absolutely NO SHADE on the Koko Head trail. For that reason, I would highly recommend going in the early morning. As a matter of fact, I added this hike to my list of the best sunrise hikes on Oahu. But if you’re not quite a sunrise person, I’d say start at 9 a.m. at the absolute latest. What Should I Bring to Hike Koko Head? Water is a NECESSITY on the Koko Head hike. It gets very hot, and you know your body will be releasing a lot of sweat as you power through those very steep steps! Consider bringing your water in a nice reusable water bottle while you’re at it. If you burn easily (or at all), you should put on sunscreen for this hike. As I said before, there is no shade. Steam2Sea, Raw Elements, and Kokua Sun Care Hawaii are all brands of sunscreen that do not hurt the environment. If you want any shade on this hike, you’re going to have to bring your own in the form of a hat. Between the rickety old wooden railroad track and the thin dusting of dirt over it, the path up Koko Head can be pretty slippery. Get some athletic shoes that have good grip! Fila’s Women’s Hiking Shoes have been serving me well. Here’s a men’s version as well, if you’re interested. When I hike Koko Head, I prefer to keep my hands free. Towards the very top, it can get quite steep, and sometimes I will use my hands to grab onto something to steady myself. That’s why I like to keep my water and my phone safely tucked away in a miniature backpack. 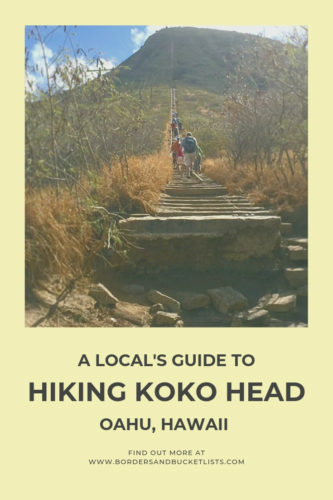 What Is the Koko Head Hike Like? There is also a small section of the Koko Head hike where there is no dirt underneath the railroad tracks. Instead, it’s a solid fifteen-foot drop, and pretty much any human can fall between the large gaps between each wooden panel. If that sounds too nerve-racking for your liking, look directly to the side of the trail when you reach this section (the right side if you’re going up and the left side if you’re going down). You’ll notice a small dirt path that allows you to go around this not-so-pleasant section and continue on your journey. My first Koko Head hike tip would have to be take breaks when you need to take breaks. Every time I did this hike, I was the person who needed the most breaks. And while it got embarrassing to stop every two steps (that’s not an exaggeration towards the top), it was better than getting 900 steps up and deciding I couldn’t make it the other 100 steps because I didn’t pace myself. My second tip for hiking Koko Head is to take it one step at a time. Literally. As you near the top, your lungs and your legs will be screaming at you, “WHY ARE WE DOING THIS?” But they won’t get all that mad if you take it one step at a time instead of 50 at a time. Lastly, I’d have to say, hike with someone else. While Koko Head is a busy hike and there will always be people to help you out if you fall (that’s actually quite common), having a friend or two with you is not only safer, but it will motivate you! If they can do it, you can do it too! What Do I See from the Top of the Koko Head Hike? By now you must be thinking, this sounds horrible. Why in the world would I do this? Besides feeling like a champion and an Iron Man athlete, the answer is the view. 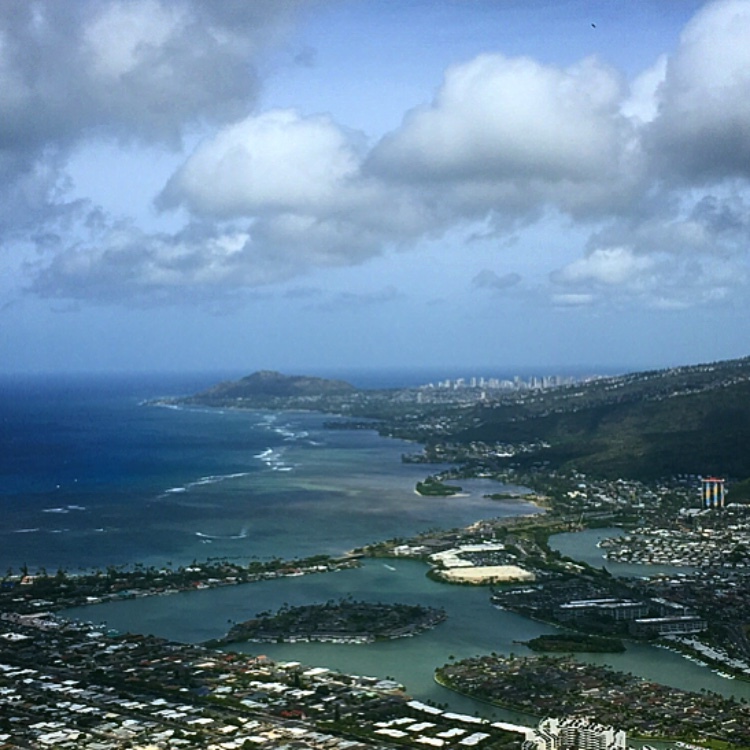 From the top of Koko Head crater hike, you can see up a small part of the eastern coastline of Oahu, Hanauma Bay, and the beautiful town of Hawaii Kai. And that’s in addition to the stunning views of the Pacific Ocean. As an added bonus, if it’s a clear day, you may be lucky enough to see the nearby Hawaiian Islands of Molokai and Lanai! Interested in adding another hike to your list of things to do on Oahu? Here are fifteen of my favorites! Thinking about adding this Koko Head hike to your list of things to do on your Oahu vacation? Pin it for later!